The habitat of the golden lion tamarin includes some of the most endangered vegetation in the world. These animals are omnivorous; feeding on fruits, insects, small lizards, snails, and even bird’s eggs. They use their long fingers to probe under bark and in crevices for insects. The golden lion tamarin is found in Atlantic coastal rainforests, particularly in Brazil. The basic group has 2-12 individuals—usually a mated pair plus their young of one or more years. The group members could be related but transfer of animals between groups has been seen and may be quite common. 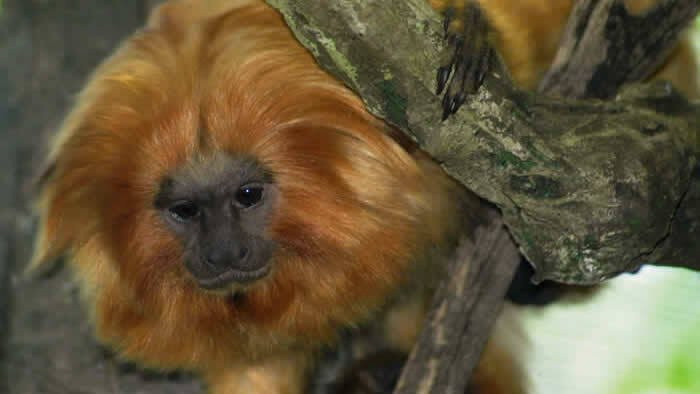 Golden lion tamarins are endangered, primarily due to habitat loss and fragmentation. More than 30 years of conservation work has helped bring them back from the edge of possible extinction, but still only 6% of their original habitat remains. Head & body: 8-13 in. 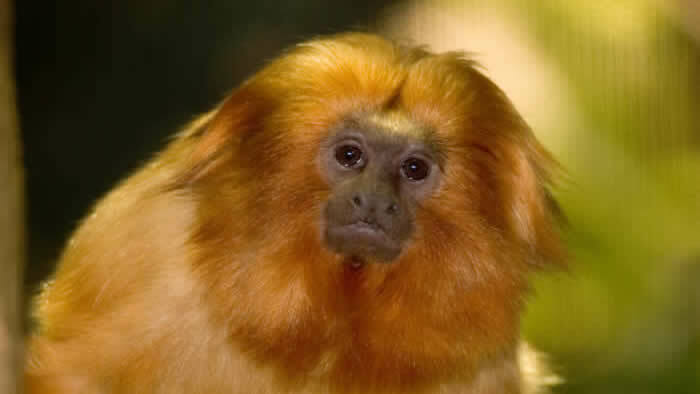 Golden lion tamarins are one of the few species to be successfully reintroduced to the wild in their native Brazil. The hairy adornments on the head of a golden lion tamarin can be used to communicate their mood. Seventeen different types of vocalizations have been identified among golden lion tamarins, including clucks for foraging, long calls for vigilance, and whines for contact. Golden lion tamarins are active and agile, able to bound rapidly from tree to tree. The father and older siblings assist in rearing the infants by carrying them on their backs. They transfer the infants to the mother to nurse, and then accept them back after feeding. Nearly all golden lion tamarins are owned by the Brazilian government, including the ones exhibited at the Minnesota Zoo. The Atlantic forest of Brazil once covered over 100 million hectares, but human developments along the coast and agricultural developments inland have destroyed the original forest. The 6% that remains is greatly fragmented. The golden lion tamarin has become the flagship species for this threatened habitat. Prior to the 1960s, golden lion tamarins were subject to considerable exploitation for use in zoos, laboratories and the pet trade. Although this has changed, the loss of habitat has not. In 1973, the Poco das Antas Biological Reserve was established, and is now the site of a reintroduction program. The Golden Lion Tamarin Conservation Program began in the early 1970s as a collaboration between the National Zoo/Smithsonian Institution and the Rio de Janeiro Primate Center. Today the GLTCP is an international cooperative program coordinated by the National Zoo/Smithsonian Institution in close collaboration with the Brazilian government’s Institution for the Environment and Natural Resources (IBAMA), the International Golden Lion Tamarin Research and Management Committee, the Rio de Janeiro Primate Center, the Brazilian Foundation for Nature Conservation, the University of Maryland and the World Wildlife Fund. Intensive efforts to establish a captive breeding program were begun in the 1960s. By 1983 the captive population contained about 370 animals and was increasing by 20-25% annually. Efforts to reintroduce some of these captive animals were initiated in Brazil in 1984 and eventually achieved a high degree of success, including substantial reproduction in the wild. The Golden Lion Tamarin Conservation project is working to increase the amount of habitat available to 25,000 hectares by the year 2025 and to see the wild golden lion tamarin population increase to 2,000. They are establishing corridors between the fragmented forests to allow the tamarins to move between previously isolated populations. As a result of environmental education programs and other work undertaken in the community, several landowners have become involved in the project and have set aside suitable areas on their own properties as private forest reserves where tamarins can be reintroduced and protected.